A jet airliner is an airliner powered by jet engines. Airliners usually have two or four jet engines; three-engined designs were popular in the 1970s but are less common today. Airliners are commonly classified as either the generally long-haul wide-body aircraft or narrow-body aircraft. The Trident emerged in response to a call by the state-owned British European Airways Corporation (BEA) for a jet airliner for its premier West European routes. BEA had been induced by the government to issue this call despite its unwillingness to buy a large jet fleet. Adherence to BEA's changing specification was widely seen as limiting the Trident's appeal and delaying its service entry. [N 1] BEA's requirements fluctuated greatly in the 1950s and in the 1960s and 1970s ended up differing considerably from what the Trident could offer. During its gestation, the Trident was also involved in a government drive to rationalise the British aircraft industry. The resulting corporate moves and government interventions contributed to delays causing it to enter service two months after its major competitor, the Boeing 727, losing further potential sales as a result. By the end of the programme in 1978, only 117 Tridents had been produced. BEA's successor British Airways withdrew its Tridents from service in the mid-1980s, and the Trident was withdrawn from service altogether in the mid-1990s. The Boeing 727 is an American midsized, narrow-body three-engined jet aircraft built by Boeing Commercial Airplanes from the early 1960s to 1984. It can carry 149 to 189 passengers and later models can fly up to 2,700 nautical miles (5,000 km) nonstop. Intended for short and medium-length flights, the 727 can use relatively short runways at smaller airports. It has three Pratt & Whitney JT8D engines below the T-tail, one on each side of the rear fuselage with a center engine that connects through an S-duct to an inlet at the base of the fin. The 727 is the only Boeing trijet, as a commercial design entering production. The Vickers Viscount was a British medium-range turboprop airliner first flown in 1948 by Vickers-Armstrongs. A design requirement from the Brabazon Committee, it entered service in 1953 and was the first turboprop-powered airliner. The Vickers Vanguard was a British short/medium-range turboprop airliner introduced in 1959 by Vickers-Armstrongs, a follow-up to its successful Viscount design with considerably more internal room. The Vanguard was introduced just before the first of the large jet-powered airliners, and was largely ignored by the market. Only 44 were built, ordered by Trans-Canada Air Lines (TCA) and British European Airways (BEA). Marshal of the Royal Air Force William Sholto Douglas, 1st Baron Douglas of Kirtleside, was a senior commander in the Royal Air Force. After serving as a pilot, then a flight commander and finally as a squadron commander during the First World War, he served a flying instructor during the inter-war years before becoming Director of Staff Duties and then Assistant Chief of the Air Staff at the Air Ministry. The Bristol Aeroplane Company, originally the British and Colonial Aeroplane Company, was both one of the first and one of the most important British aviation companies, designing and manufacturing both airframes and aircraft engines. Notable aircraft produced by the company include the 'Boxkite', the Bristol Fighter, the Bulldog, the Blenheim, the Beaufighter, and the Britannia, and much of the preliminary work which led to the Concorde was carried out by the company. In 1956 its major operations were split into Bristol Aircraft and Bristol Aero Engines. In 1959, Bristol Aircraft merged with several major British aircraft companies to form the British Aircraft Corporation (BAC) and Bristol Aero Engines merged with Armstrong Siddeley to form Bristol Siddeley. The Bristol Type 200 was a proposal for a short-range aircraft by the Bristol Aeroplane Company in 1956. Although it was designed in response to a specification issued by British European Airways (BEA), the Type 200 was larger than the airline's requirements and was closer to the Boeing 727 in size and range. The project was cancelled when BEA selected the Hawker Siddeley Trident instead. 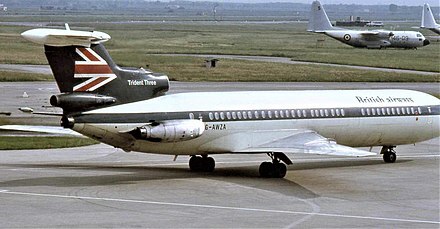 The Trident went on to have a production run of 117, while the 727 had a production run of over 1800. Along with the Vickers V-1000, it is seen by some as one of the great "what ifs" of British aviation, although it never got beyond the drawing board. Avro was a British aircraft manufacturer. Its designs include the Avro 504, used as a trainer in the First World War, the Avro Lancaster, one of the pre-eminent bombers of the Second World War, and the delta wing Avro Vulcan, a stalwart of the Cold War. From the outset, the D.H.121 was planned to employ avionics which were very advanced for the period. Among other capabilities, they would offer automatic approach and landing within a few years of service entry. The avionics were also to have triplicated components for reliability and to allow "majority 2:1 voting" for aircraft guidance during automatic approach and landing. The physical dimensions of most avionics of the period required them to be housed in a large compartment beneath the Trident's flightdeck; the compartment's size was among the factors dictating a distinctive nose undercarriage design resulting in the nose landing gear offset by 2 ft (61 cm) to the port side and retracting sideways to stow across the D.H.121's longitudinal axis. 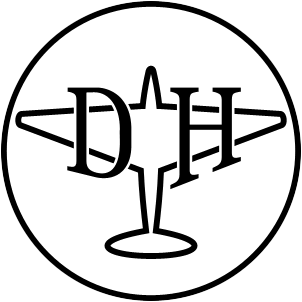 By 1960, de Havilland had been acquired by the Hawker Siddeley group. After the de Havilland takeover, Airco was disbanded. Hunting was marshalled into the competing newly formed British Aircraft Corporation (BAC); their departure removed any putative possibility of the Hunting 107 (later the BAC One-Eleven) being marketed alongside the D.H.121 as a complementary, smaller member of the same airliner family. Fairey Aviation, partially incorporated into Westland Aircraft, also left the D.H.121 project. [N 4] With the move to Hawker Siddeley Aviation, the designation was eventually revised to the HS 121. The reorganisation of the industry had compounded upon the delays caused by BEA's changes to the specification, which had in turn harmed the Trident's competitiveness against the Boeing 727. The Trident was a jet airliner of all-metal construction with a T-tail and a low-mounted wing with a quarter-chord sweepback of 35 degrees. It had three rear-mounted engines: two in side-fuselage pods, and the third in the fuselage tailcone, aspirating through an S-shaped duct. One version, the 3B, had a fourth "boost" engine aspirated through a separate intake duct above the main S-duct. All versions were powered by versions of the Rolls-Royce Spey, while the boost engine was also by Rolls-Royce: the RB.162, originally intended as a lift engine for VTOL applications. Ex-British European Airways Trident 3B (G-AWZK) preserved at Manchester Airport, England. Delivered new in 1971, it flew for BEA and British Airways, retiring in 1985. The Trident was one of the fastest subsonic commercial airliners, regularly cruising at over 610 mph (980 km/h). At introduction into service its standard cruise Mach Number was 0.88/ 380 kn IAS, probably the highest of any of its contemporaries. Designed for high speed, with a critical Mach number of 0.93,  the wing produced relatively limited lift at lower speeds. This, and the aircraft's low power-to-weight ratio, called for prolonged takeoff runs. Nevertheless, the Trident fulfilled BEA's 6,000 ft (1,800 m) field length criterion and its relatively staid airfield performance was deemed adequate before the arrival into service of the Boeing 727 and later jet airliners built to 4,500 ft (1,400 m) field length criteria. The aerodynamics and wing was developed by a team led by Richard Clarkson, who would later take the Trident's wing design for the wing of the Airbus A300; for the Trident he won the Mullard Award in 1969. The Trident was routinely able to descend at rates of up to 4500 ft/min (23 m/s) in regular service. In emergency descents of up to 10,000 ft/min, it was permissible to use reverse thrust. Below 280 kn IAS, it was also possible to extend the main landing gear for use as an airbrake. The Trident's first version, Trident 1C, had the unusual capability of using reverse thrust prior to touchdown. The throttles could be closed in the flare and reverse idle set to open the reverser buckets. At pilot discretion, up to full reverse thrust could then be used prior to touchdown. This was helpful to reduce hydroplaning and give very short landing runs on wet or slippery runways while preserving wheel brake efficiency and keeping wheel brake temperatures low. Brakes were fitted with the Dunlop Maxaret anti-skid system. The Trident's advanced avionics displayed the aircraft's momentary position relative to the ground on a moving map display on the centre instrument panel. This electro-mechanical device also recorded the aircraft's track using a stylus plotting on a motor-driven paper map. Positional information was given by a Doppler navigation system which read groundspeed and drift data which, alongside heading data, drove the stylus. Hawker Siddeley Aviation, which had absorbed de Havilland, needed additional customers for the Trident, so entered into discussions with American Airlines (AA) in 1960. American requested additional range than what the aircraft initially had, which meant that the original DH121 design would have fulfilled its requirements almost perfectly. In response, design began on a new Trident 1A, powered with up-rated Rolls-Royce Spey 510 engines of 10,700 lbf (47.6 kN) thrust, and a larger wing with more fuel, raising gross weight to 120,000 lb (54,000 kg) and range to 1,800 miles (2,900 kilometres). However, American eventually declined the aircraft in favour of the Boeing 727. Some of these changes were added into the original prototype, and it was renamed the Trident 1C. The main difference was a larger fuel tank in the centre section of the wing, raising weights to 115,000 lb (52,000 kg) and range to 1,400 miles (2,300 kilometres). The first Trident 1, G-ARPA, made its maiden flight on 9 January 1962 from Hatfield Aerodrome,  and entered service on 1 April 1964. By 1965, there were 15 Tridents in BEA's fleet and by March 1966, the fleet had increased to 21. Hawker Siddeley then proposed an improved 1C, the Trident 1E. This would be powered by 11,400 lbf (50.7 kN) Spey 511s, have a gross weight of 128,000 lb (58,000 kg), an increased wing area by extending the chord, and the same fuselage but with up to 140 seats in a six-abreast configuration. This specification took the 1C closer to the larger concept of the original DH121, but with 7,000 lbf (31 kN) less thrust. There were only a few sales of the new design: three each for Kuwait Airways and Iraqi Airways, four for Pakistan International Airlines (later sold to CAAC), two each for Channel Airways and Northeast Airlines, and one for Air Ceylon. Channel Airways' aircraft were equipped with cramped, 21" pitch, seven-abreast seating in the forward section. A Trident 3B in crossover BEA/British Airways livery. At this point, BEA decided that the Trident was too short-legged for its ever-expanding routes, and that an even longer-ranged version was needed. Hawker Siddeley responded with another upgrade designated Trident 1F. It would have the Spey 511 engines, a 2.8 m fuselage stretch, a gross weight of 132,000 lb (60,000 kg) and up to 128 seats in the original five-abreast configuration. BEA planned to buy 10 1Fs, plus an option for 14 further aircraft. As work continued on the 1F the changes became so widespread that it was renamed the Trident 2E, E for Extended Range. Now powered by newer Spey 512s with 11,930 lbf (53.1 kN) thrust, it also replaced wing leading-edge droops with slats, and extended the span with Küchemann-style tips. [ citation needed ] It had a gross weight of 142,400 lb (64,600 kg) and a 2,000 miles (3,200 kilometres) range. BEA bought 15,  while two were bought by Cyprus Airways. CAAC, the Chinese national airline, bought 33. The first flight of this version was made on 27 July 1967 and it entered service with BEA in April 1968. Subsequently, the Trident was becoming the backbone of BEA's fleet and BEA wanted an even larger aircraft. Hawker Siddeley offered two new designs in 1965: a larger 158-seat two-engine aircraft otherwise similar to the Trident known as the HS132; and the 185-seat HS134, which moved the engines under the wings, a design very similar to the Boeing 757. Both were to be powered by a new high-bypass engine under development at the time, the Rolls-Royce RB178. 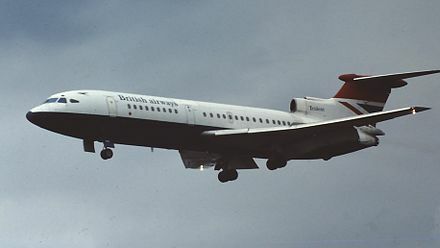 BEA instead opted for Boeing 727s and 737s to fill the roles of both the BAC 1–11 and Trident, but this plan was vetoed by the British government. BEA returned to Hawker Siddeley and chose a stretched version of the basic Trident, the Trident 3. A fuselage stretch of 5 m (16 ft 5 in) made room for up to 180 passengers; Hawker Siddeley raised the gross weight to 143,000 lb (65,000 kg) and made modifications to the wing to increase its chord; the engines remained the same. BEA rejected the design as being unable to perform adequately in "hot and high" conditions, in light of such issues experienced with the Trident 2E. Since the Spey 512 was the last of the Spey line, extra thrust would be difficult to obtain. Instead of attempting to replace the three engines with a completely different type, which would have been difficult with one engine buried in the tail, Hawker Siddeley's engineers decided to add a fourth engine in the tail, the tiny Rolls-Royce RB162 turbojet, fed from its own intake behind a pair of movable doors. The engine added 15% more thrust for takeoff, while adding only 5% more weight, and it would only be used when needed. BEA accepted this design as the Trident 3B, and ordered 26. The first flight was on 11 December 1969 and the aircraft entered service on 1 April 1971. Addition of extra fuel capacity resulted in the Super Trident 3B. Only 117 Tridents were produced, and none are in service anymore. In contrast, 1832 Boeing 727 aircraft (designed to the Trident's original specification) were built, many of which are still in service today. On 30 June 1966, Trident 1E registration 9K-ACG touched down 3 miles short of the runway at Kuwait International Airport. There were no fatalities but the aircraft was written off. On 14 March 1979, a CAAC Airlines Trident 2E registered B-274, crashed into a factory near Beijing, injuring at least 200. The crash was caused by an unqualified pilot who stole and flew the airliner. 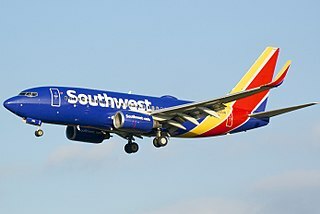 All 12 people on board were killed, as well as 32 people on the ground. Bahamasair Holdings Limited is an airline headquartered in Nassau. It is the national airline of the Bahamas and operates scheduled services to 32 domestic and regional destinations in the Caribbean and the United States from its base at Lynden Pindling International Airport (NAS). Hawker Siddeley was a group of British manufacturing companies engaged in aircraft production. Hawker Siddeley combined the legacies of several British aircraft manufacturers, emerging through a series of mergers and acquisitions as one of only two such major British companies in the 1960s. In 1977, Hawker Siddeley became a founding component of the nationalised British Aerospace (BAe). Hawker Siddeley also operated in other industrial markets, such as locomotive building and diesel engine manufacture. The company was once a constituent of the FTSE 100 Index. The British Aircraft Corporation One-Eleven, also known as the BAC-111 or BAC 1-11, is a British short-range jet airliner used during the 1960s and 1970s. It was the second short-haul jet airliner to enter service, following the French Sud Aviation Caravelle. The aircraft was also produced under licence in Romania during the 1980s as the Rombac One-Eleven. Cayman Airways is the flag carrier airline of the British Overseas Territory of the Cayman Islands. With its head office in Grand Cayman, it operates mainly as an international and domestic scheduled passenger carrier, with cargo services available on most routes. Its operations are based at Owen Roberts International Airport in George Town, Grand Cayman. The Rolls-Royce Spey is a low-bypass turbofan engine originally designed and manufactured by Rolls-Royce that has been in widespread service for over 40 years. A co-development version of the Spey between Rolls-Royce and Allison in the 1960s is the Allison TF41. The BAC Two-Eleven and BAC Three-Eleven were pair of proposals for British airliners that were produced by the British Aircraft Corporation (BAC) during the late 1960s. The projects had emerged from design studies which had been aimed at competing first with the Boeing 727-200 and then with the proposed European Airbus. Channel Airways was a private airline formed in the United Kingdom in 1946 as East Anglian Flying Services. The Rolls-Royce RB162 was a simply constructed and lightweight British turbojet engine produced by Rolls-Royce Limited. Developed in the early 1960s, it was specially designed for use as a lift engine for VTOL aircraft but was also used in a later variant of the Hawker Siddeley Trident airliner as an auxiliary boost engine. A smaller related variant, the RB181 remained a design project only, as did a turbofan version designated RB.175. The Rolls-Royce RB.141 Medway was a large low-bypass turbofan engine designed, manufactured and tested in prototype form by Rolls-Royce in the early-1960s. The project was cancelled due to changes in market requirements that also led to the development and production of the smaller but similar Rolls-Royce Spey, and the cancellation of the Armstrong Whitworth AW.681 military transport aircraft project. Robert Edward Grigg was a British aerospace engineer, and was the chief designer of the highly-successful British Aerospace 146. Guilin Qifengling Airport is a military airport in Guilin, Guangxi, China. Built in 1958, the airport originally served all commercial traffic to Guilin. It was poorly equipped to handle the rapid increase in tourism to the city during the 1990s. As a result, Liangjiang International Airport was opened in 1996 and all commercial flights shifted to it. CAAC Airlines was the airline division of the Civil Aviation Administration of China (CAAC) and the monopoly civil airline in the People's Republic of China. It began operating scheduled domestic flights in 1949. In 1988, the monopoly was broken up and CAAC Airlines was split into six regional airlines, which later consolidated into China's Big Three airlines: Air China, China Southern Airlines, and China Eastern Airlines. ↑ British aviation writer Bill Gunston was influential in elaborating this discourse. ↑ "B.E.A. 's feelings on these points were not inflexible. Their specification constituted a basis for discussion ..."
↑ Hunting and Fairey remained D.H.121 subcontractors. ↑ "Airliner price index". Flight International. 10 August 1972. p. 183. 1 2 Kenward, Michael. "Cutting through the fog with autoland." New Scientist, 10 February 1972. pp. 321–323. ↑ Bearup, Benjamin. "Flashback Friday: 50th Anniversary of Autolanding." Archived 22 December 2015 at the Wayback Machine Airways News, 31 July 2015. 1 2 "Hawker Siddeley Mergers." Flight International, 12 February 1960, p. 196. 1 2 Wood 1975, p. 99. ↑ Staniland 2003, p. 149. ↑ Wood 1975, pp. 99–100. 1 2 Wood 1975, p. 100. 1 2 Munson 1967, pp. 153–154. ↑ Wood 1975, pp. 100–101. ↑ ""Thoughts on the D.H.121." Flight International 28 February 1958, p. 267. ↑ Wood 1975, p. 101. 1 2 3 4 5 Wood 1975, p. 102. ↑ Wood 1975, pp. 97, 102. ↑ "Deep-Stall Avoidance." Concept to Reality. Retrieved: 13 November 2010. 1 2 "Touchdown by Computer." Time Magazine, 18 June 1965. Retrieved: 17 July 2009. ↑ Wood 1975, pp. 102–103. 1 2 3 4 5 6 Wood 1975, p. 103. 1 2 3 4 5 6 7 8 9 10 Wood 1975, p. 104. ↑ Bacon, Roger. "Straight & Level." Flight International, 16 December 1960, p. 953. ↑ "Airco D.H.121". Flight International, 25 July 1958. ↑ "Bristol 200 – a Preliminary Appraisal." Flight International, 24 January 1958, p. 109. ↑ "B.E.A. 's Jet: Cards on the Table." Flight International, February 1958, p. 167. 1 2 Staniland 2003, pp. 149–150. ↑ Wood 1975, pp. 103–104. ↑ Staniland 2003, p. 150. ↑ "B.E.A. versus Traffic Recession." Flight International, 28 August 1958, p. 74. 1 2 "Subsonic Setback?" Flight International, 29 May 1959, p. 753. ↑ "A Smaller D.H.121." Flight International, 14 August 1959, p. 26. ↑ "Airco D.H.121: Preliminary Details." Flight International, 28 August 1959, p. 91. ↑ "D.H.121: Progress Report on Britain's 600 m.p.h. Viscount Replacement." Flight International 22 January 1960, p. 102. ↑ "The D.H.121 and Automatic Landing." Flight International, 22 January 1960, p. 120. ↑ "Commercial Aircraft of the World: D.H.121 Trident Mk 1." 'Flight International, 18 November 1960, p. 798. ↑ Wood 1975, pp. 104–105. ↑ Gunn 1999, pp. 184–185. 1 2 Wood 1975, p. 105. ↑ Wood 1975, pp. 105–106. 1 2 Wood 1975, p. 106. ↑ Wood 1975, pp. 106–107. ↑ Wood 1975, pp. 107–108. ↑ Wood 1975, p. 107. 1 2 3 Wood 1975, p. 108. ↑ "Talking to Mr. Beall: Boeing's Senior Vice-President in London." Flight International, 14 October 1960, p. 603. ↑ Pratt, Roger, ed. Flight Control Systems: Practical Issues in Design and Implementation. Kidlington, Oxfordshire, UK: Elsevier Science Ltd., 2000. ISBN 0-85296-766-7. ↑ "Trident Automatically." Flight International, 17 June 1965, p. 972. 1 2 3 Jackson 1973, pp. 272–276. ↑ "Smiths Industries Flight Data/Cockpit Voice Recorders." ntsb.gov. Retrieved: 1 April 2010. ↑ "BEA orders more Tridents." Glasgow Herald, 6 August 1965. ↑ "British bid to sell jets to China." The Age, 10 May 1971. ↑ "After Trident, Concorde?" Glasgow Herald, 5 December 1973. ↑ Imrie, Ian. "New snag could again delay Tridents." Glasgow Herald, 12 August 1977. ↑ Kingsley-Jones, Max. "ANALYSIS: Why there was more to the HS Trident than just a lot of noise." Flight International, 14 December 2015. ↑ Taylor 1980, p. 269. ↑ Falcus, Matt. "Save the Trident." savethetrident.org. Retrieved: 1 April 2010. ↑ "Iconic plane on show after five-year restoration." Northern Echo, 3 July 2015. ↑ "HS.121 Trident series 3B-101 'G-AWZK'." Archived 15 December 2009 at the Wayback Machine www.ringwayreports.co.uk, 7 August 2007. Retrieved: 27 September 2009. ↑ "Accident description: Hawker Siddeley HS-121 Trident 1C, 3 June 1966." aviation-safety.net. Retrieved: 13 November 2010. ↑ "Hull-loss description: Hawker Siddeley HS-121 Trident 1s, 3 June 1966." aviation-safety.net. Retrieved: 13 November 2010. ↑ "Criminal Occurrence description: Trident 1E crash, 13 September 1971." aviation-safety.net. Retrieved: 13 November 2010. ↑ Civil Aircraft Accident Report 4/73: Trident I G-ARPI: Report of the Public Inquiry into the Causes and Circumstances of the Accident near Staines on 18 June 1972 – Appendix A Accident Investigation Branch, Department of Trade and Industry. HMSO, London, 1973. ↑ "Accident description: Hawker Siddeley HS-121 Trident 1C, 18 June 1972." aviation-safety.net. Retrieved: 13 November 2010. ↑ "Accident description: Hawker Siddeley HS-121 Trident 3B, 10 September 1976." aviation-safety.net. Retrieved: 13 November 2010. ↑ "CAAC Trident 2E." planecrashinfo.com. Retrieved: 1 April 2010. ↑ "ASN Aircraft accident: Hawker Siddeley HS-121 Trident 2E B-266 Yangsuo." aviation-safety.net. Retrieved: 1 April 2010. ↑ "Accident description: Hawker Siddeley HS-121 Trident 2E, 31 August 1988." aviation-safety.net. Retrieved: 13 November 2010. 1 2 Jackson 1973, p. 276. "Classic Aircraft (Trident at 50: Tales of the Trident). Classic Aircraft online, March 2012, pp. 51–64, ISSN 2049-2081. Hersham, UK: Ian Allan Publishing. Wikimedia Commons has media related to Hawker Siddeley Trident .